Happy new year! So far it has been an AWESOME year for me. My daughter and her family moved back to CA from WI and I am over the moon to have them back. 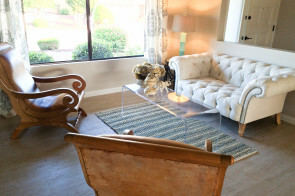 Then this rental renovation house went on the market and we have a buyer. Woohoo. I have already started looking for my next fixer upper, I’m hooked! 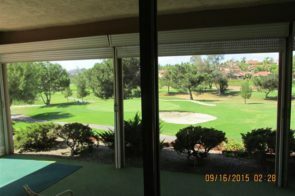 Now that this house in escrow, I thought I better do some post on how it looks now that everything is completed. 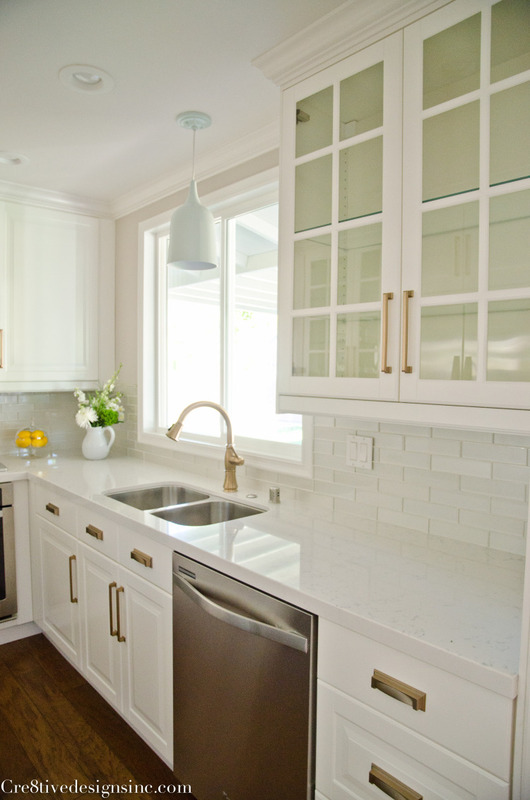 Most people think that you have to match the hardware and faucet to the appliances. That you can’t mix metals. But you can! 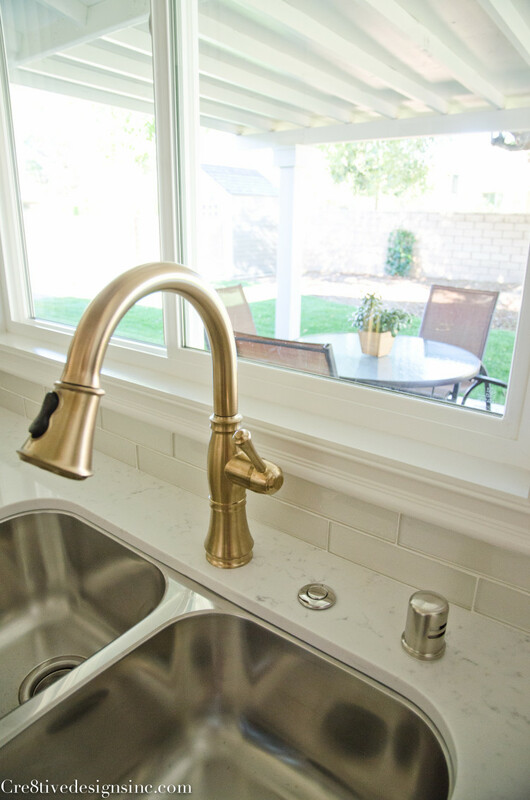 The Delta faucet is the same champagne bronze as the hardware, so that ties it all together. It has a slight hint of silver in it, which compliments the stainless steel. I used a wall oven and a drop in cooktop instead of the standard slide in range that most people put in small kitchens. It costs a little more to do them separately, but I like the custom look of it better. We used LED canned lights in the ceiling, and wow do they ever make a difference! I am a big fan of them now, I want to change all my recessed lights in my own house to LED’s. It’s a crisp white light that they give off, but not like a hospital white feeling. These inserts were by far the hardest to put together but so worth it. I love how this kitchen turned out, but I have to say the finished bathrooms are my absolute favorites! I will post those next week, I think you will love them too. Wow! All I can say is WOW! What a transformation. I pinned and pinned so many things to use for future reference. 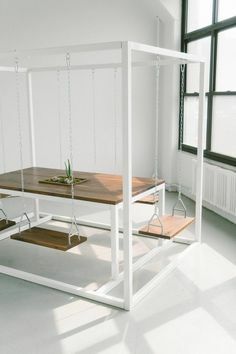 Is the hardware from Ikea as well? Thanks so much for filling us all in on the particulars. Great result! Thank you Suzy! The cabinet hardware is made by Atlas Hardware and you can buy them on line. I love it all, but the touch of gold has me swooning. Love! Fantastic work! I wish I had a kitchen like that! I really like that you mixed metal finishes too. You did it seamlessly and it’s also quite practical. yep, all I can say is WOW too! 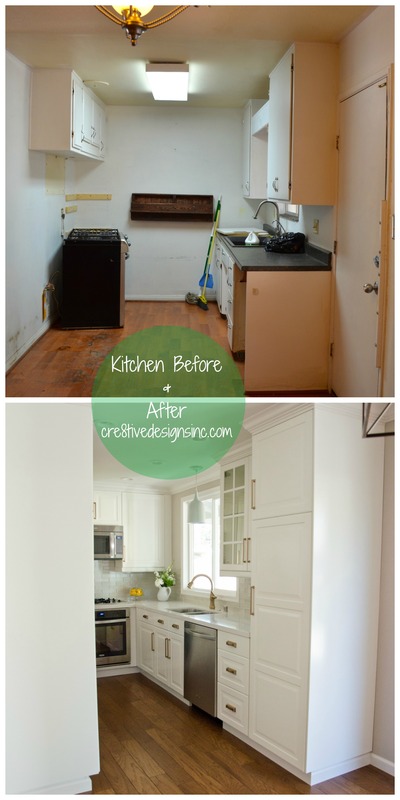 no other words for this beautiful IKEA kitchen makeover! I noticed there were no plugs (outlets) I scrolled back up to look for them, then you said they were underneath the cabinets. LOVE that! great job Stephanie! Someone is going to live their happily ever after there in your flip! Good luck with the next one! so happy the little birdies have come home to nest. I know that makes you one happy mamma! Linda, the cabinets from Ikea were AKURUM, and the cost of just the cabinets was about $4100. Ikea is eliminating the Akurm line in February and replacing them with a new cabinet called SEKTION. Hope that helps! Good luck on updating your kitchen! did you purchase your countertops from ikea as well? No I did not purchase the countertops from Ikea. Their prices weren’t as affordable as going to an outside source. No I did not purchase the countertops from Ikea. Their prices were a little high. Where is the cabinet hardware from? Beautiful kitchen! 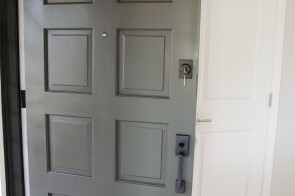 The cabinet hardware is by Atlas Hardware the Sutton Place collection in champagne bronze. I am absolutely in LOVE with this kitchen! I am too in the middle of a kitchen remodel using Ikea cabinets, and I love how yours doesnt look like an Ikea kitchen. We are planning on also putting custom crown molding on the upper cabinets. My question for you is what is the ceiling height of the kitchen (ours is the standard 8ft)? And what is the distance between the countertops and upper cabinets? 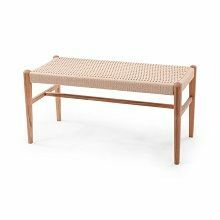 Ours would only be 16″ with the moldings, and the recommended height is no less than 17″. I dont think an inch is a huge deal, but wanted to see if this kitchen is the same. Thanks! Thank you Michael for the compliments! The ceiling height was 8′. 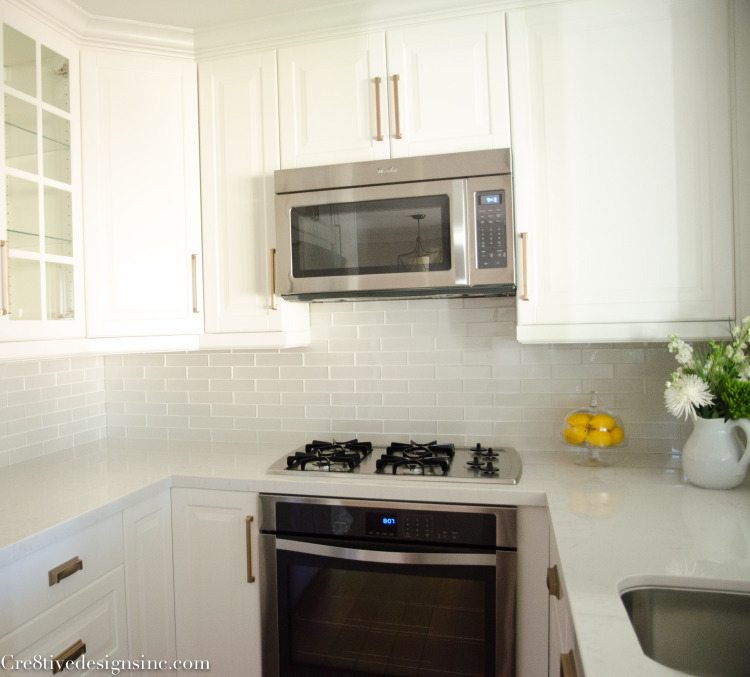 The standard 17″ is just a recommendation when it comes to upper cabinet and counter space, I can not remember what the distance was that I used, but I am pretty sure it was 16″. One inch isn’t a huge deal, so I’d go for it! Hi, first of all I love the look of this kitchen. You did an amazing job. We are planning on doing something similar on our house. We are still in the planning stages – but trying to figure out the large pantry type cabinets. Can you tell me what size you used? What is your toe kick height and your crown molding size. Thank you so much for sharing this. The toe kick height is determined by the lower cabinets. I want to say they come with a 3″ high toe kick. The crown we used I think was a 4″? We did have to put a filler piece in between the top of the cabinet and where the crown started. Only because we had already put the crown up in the other rooms and we wanted to continue the same height into the kitchen. The pantry cabinet is what determines where your upper height ends below the ceiling. I used the 3-D program on the Ikea site, and then went over it a couple of times with the Kitchen staff at Ikea to make sure I got everything right. Which, I didn’t, but it was all an easy fix to make returns and get what I needed. The previous kitchen I did with Ikea cabinets, it went a lot smoother and hardly any errors than this one did. Can’t tell you why that was, no matter what I thought I did right ended up being wrong…but in the end I got it right and as you can see it turned out beautifully. Love this kitchen- I’m actually using it as a rough guide for our kitchen remodel. Did you use 30 inch or 40 inch wall cabinets? And what size crown did you use? I know you mentioned that you had to add a filler piece to keep the crown uniform throughout. 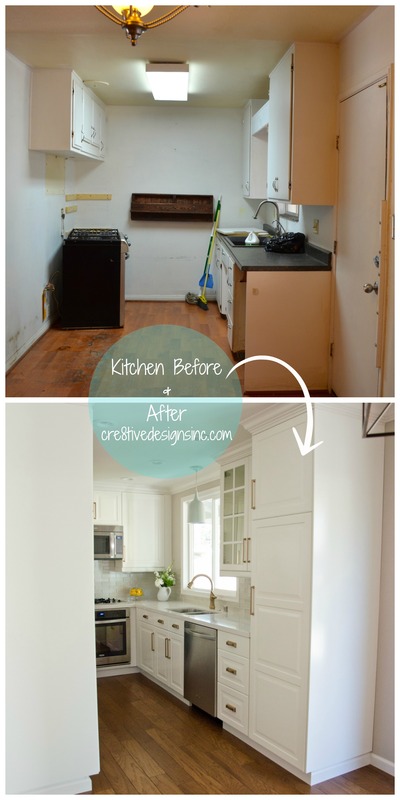 Love this renovation! Wondering what 2 x 8 pearl glass backsplash you used? At that point in our DIY kitchen reno and love the look. 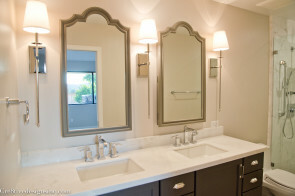 Kate, I purchased the glass tile from European Tile art in San Diego. You could call them to find out pricing. WOW! WOW! WOW! You are talented. I was wondering where did you get the countertops from and the cost of them? 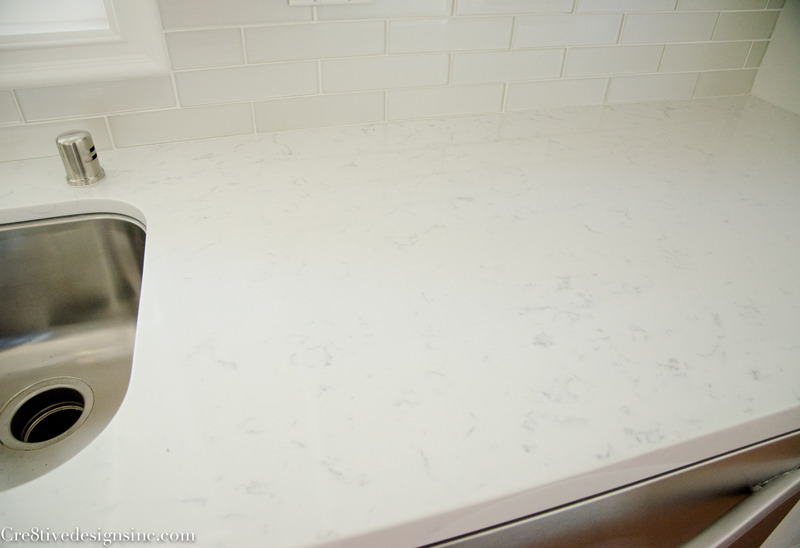 The countertops are Cararra cashmere Quartz by MSI. The cost for material and fabrication was around $2600. Outstanding! What a gorgeous renovation. I’m curious about the little jibber-jabbers to the right of the faucet — spray? soap? eject button? The button on the counter to the right of the faucet is the switch for the garbage disposal. Thanks! I’m still curious about the other thing to the right of the disposal button, but anyway, this is just a gorgeous gorgeous kitchen. I love the kitchen. I have a question about how much it cost to have the electrical put under the cabinets?? And does that mean they have to cut into your cabinet? I love the clean look! Can you tell me what the paint colour is in the dining area? So what was the total cost of your renovation. My kitchen will have similar layout but the sink is on the other side. I have not set down and done the exact numbers yet, but I estimate the total cost of the kitchen with countertops and backsplash was about $10,000. The cost to do this size of a kitchen could be a lot less if you do most of the work yourself. My estimate costs includes labor to assemble and install the cabinets, labor to fabricate the countertops and labor to install the backsplash. Labor adds up fast, and you could save money by assembling the cabinets yourself. They are not hard to do, but very time consuming. I’ve assembled an Ikea a kitchen before, so I knew this time around I wanted to pay for someone else to do it. 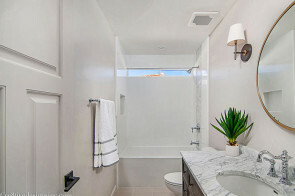 Hi Love the kitchen remodel I have a similar layout but behind the wall where you have placed the refrigerator, I have a small powder room (bath room) Is it not a good idea to remove this? 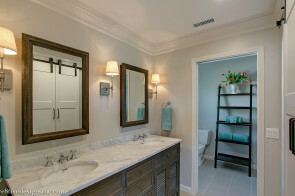 I would love to have an answer as to whether to remove the bathroom, but not knowing what other bathrooms you have in your house, and the exact layout, I can’t say yes or no as to whether this is a good idea or not. Absolutely beautiful. How many recessed lights did you put in the ceiling? It looks like 6 recessed lights in the kitchen. They are LED can lights and give off a wonderful white light. Thank you. I saw the 6 but wasn’t sure if there were any more i couldn’t see. Thank you! I post my projects mainly to give other people inspiration. I do not have ads, or sponsors, nor so I make any money from this blog. So, when I get such a nice comment like yours, it makes all the time I spend doing these post SO worth it! Such a gorgeous renovation! If you don’t mind me asking, what ballpark estimation would you give the cost of renovating a kitchen to look like this? I’m looking into renovating and don’t have a sense of what costs would be (including things like the electrician and plumber in addition to material costs). Would you say (ballpark) this was a $10,000 renovation?or $15,000? Thanks for sharing! Hi Bethany, it is tricky to give an estimate not seeing the work that would need to be done in your own space. 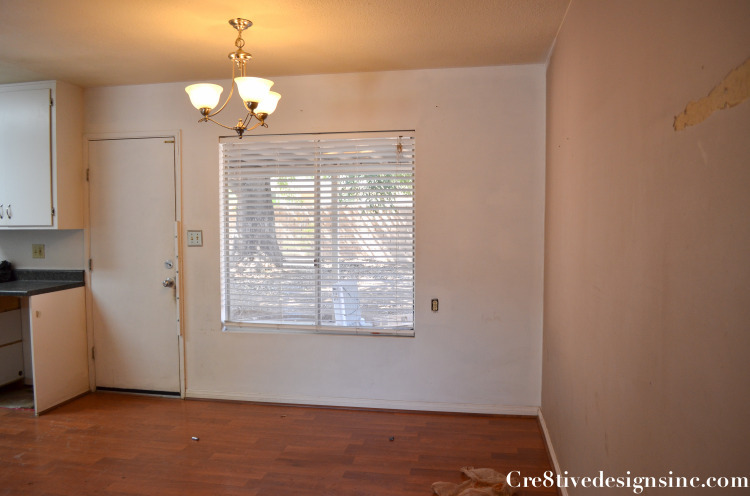 This one was closer to $15,000 because the electrical and plumbing was SUCH a mess or totally missing. That is why I chose the Ikea cabinets, I had so many other costs that I needed to save money somewhere. I was able to get the look I wanted, but for a fraction of the cost. The Ikea cabinets were less than $4000, but then you have to put them all together and then install them. I actually paid someone to do this for me, which also increased my price by $1200. (I put them together once for my daughter’s kitchen, and once was enough for me in my life time) The countertops, I used a slab quartz, and then had it fabricated. That again, increased the price. 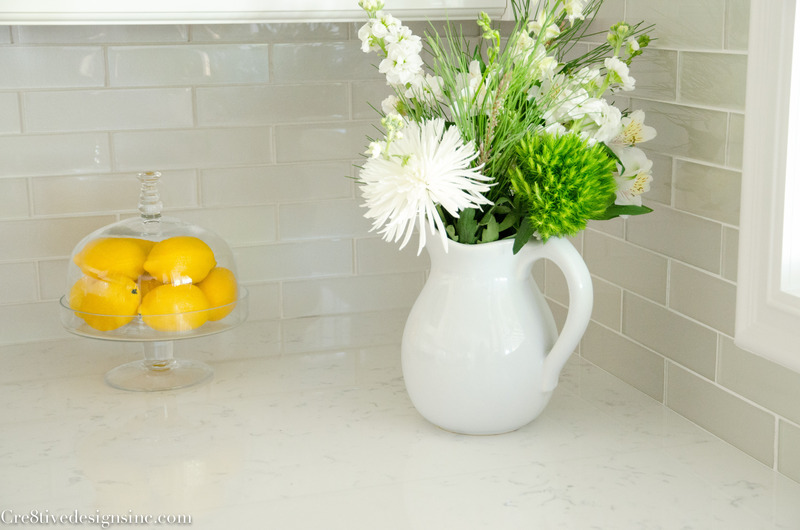 A cost effective way to add quartz countertops is to buy pre-fab quartz. It’s a huge savings, and the material is similar. You could save a lot of money by doing a lot of the work yourself, to bring it down closer to the $10,000 range. Hope that helps! This is incredibly helpful! Thank you for such a great response! I have a similar kitchen layout, and am thinking of a wall oven/cooktop combo like you did. Did Ikea have a cabinet that worked out of the box, or did the base cabinet have to be modified to fit the wall oven? Hi Karen, I too prefer the wall oven and cooktop look over a slide in range. It isn’t always doable, and does costs a little more to get this look, but it’s my favorite way to give a kitchen a more custom look. Plus a wall oven is bigger inside than a slide in range 🙂 I didn’t have to modify the actual cabinet to fit the oven, but we had to cut some additional holes for the electric. You just have to check the specs on the wall oven you are purchasing, to make sure that it will fit in the Ikea wall oven cabinets. This kitchen has given me hope and inspiration! I have a small 1940’s kitchen and since an addition to expand the kitchen is WAY out of the budget, I have been struggling to find a solution, My one question for you, to see if this layout if feasible for us, it what were the dimensions of the room? 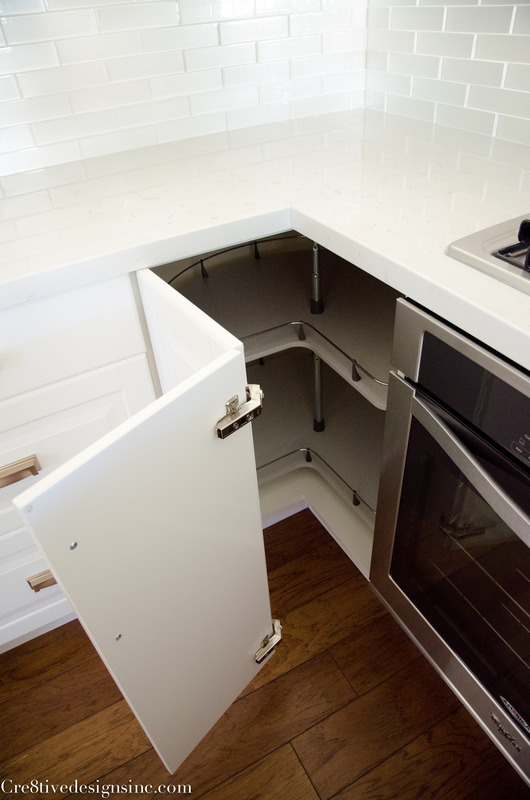 Did it feel too small as a u-shape kitchen in such a small space? Thank you so much for posting this amazing kitchen, it us stunning! I am so glad this kitchen gives you hope! 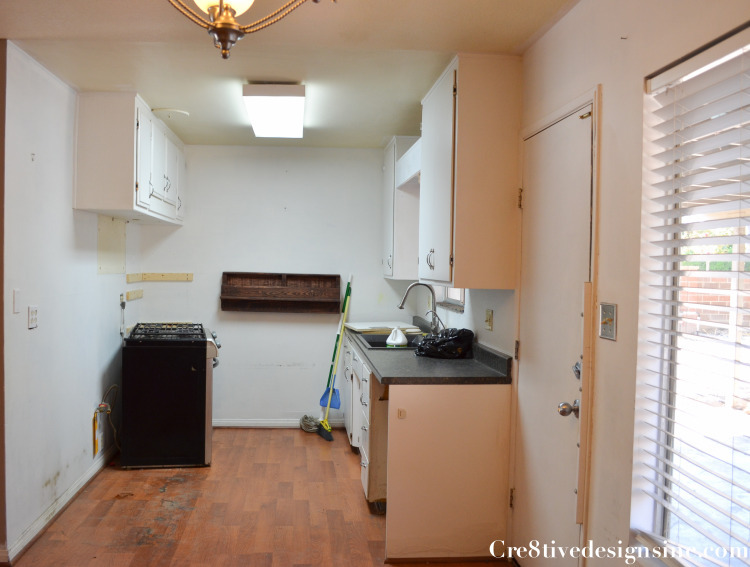 The kitchen was 8′ x 12′ The 8′ wall being the back wall of the kitchen. The “u” shaped kitchen, I felt, was the best way to get as much storage and functionality out of the kitchen as possible. It was a tight fit, but it didn’t feel cramped at all. 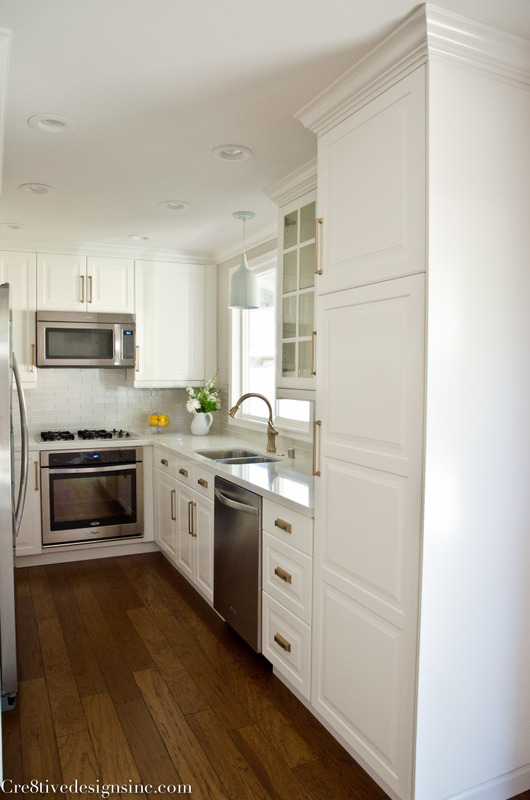 I think by using white cabinets, having a window in the space, and lighter countertops, made it feel less cramped. Do you have any photos of the under-cabinet electric plugs? We’re considering them for our kitchen reno! Love the whole kitchen!!! Hello Stephanie. Absolutely beautiful job!!! I am impressed. Can you tell me how you matched the colour of the crown molding with the colour of the cabinets so well. 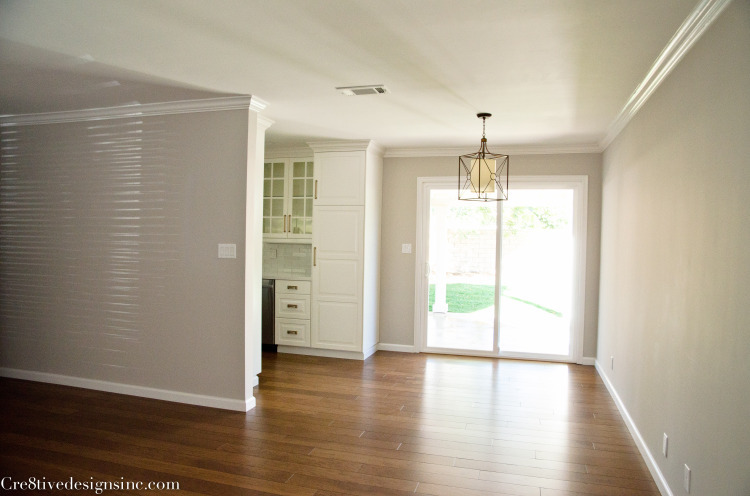 Hi Christine, I wish I could tell you a really cool secret for choosing the crown molding color to match the cabinets, but I just used my fan deck of whites from Sherwin Williams and matched the color. And thank you for your compliments on the kitchen! Thank you Jessica! I wish I could tell you the exact color…I didn’t write it down, silly me. You can always bring a door into a paint store and have them match it. So, is the crown on the rest of your house a different color than the crown at the top of the cabinets? I’m asking because we are looking at the Bodbyn off-white IKEA cabs. We will bring them to the ceiling and have crown at the top. However, the crown in the rest of our house is Snowfall White (BM)… so we’re not sure if we should continue that color on the cabinet crown, or find a color that matches the off-white of the Bodbyn, resulting in diff colored crown in the kitchen vs rest of house. Thanks! We used the same color of white for all the crown. It wasn’t an exact match, but it blended in. If your crown continues into the kitchen, and there is not real stop and starting point, I would use the Snowfall for above the cabinets as well. Stephanie, you did a fantastic job! How did you get the fridge built in? Did you modify the Ikea cabinets so they would be flush with the fridge? I can’t quite see the other side but I’m assuming the left side of the fridge is also enclosed? 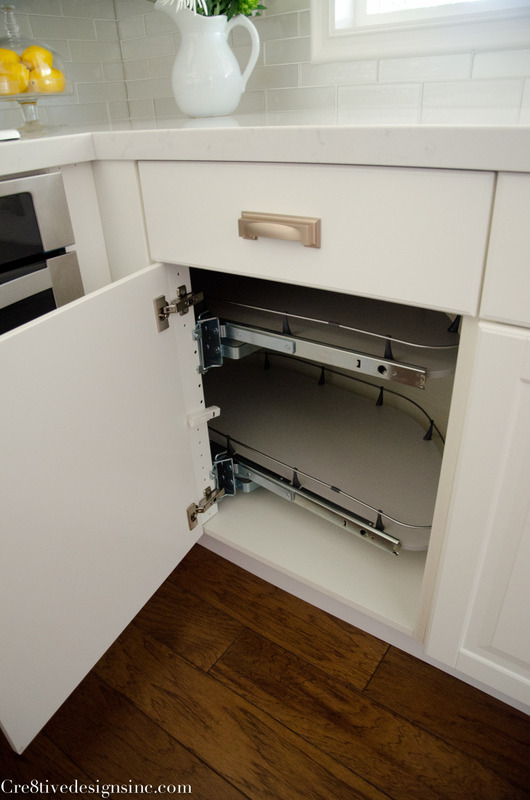 The pantry cabinet side that is next to the refrigerator is butted up to he refrigerator, and then on the other side of the refrigerator is a flat panel you order from Ikea. Thanks for the info! I did see the panels on their website. What a beautiful kitchen — so inspiring! 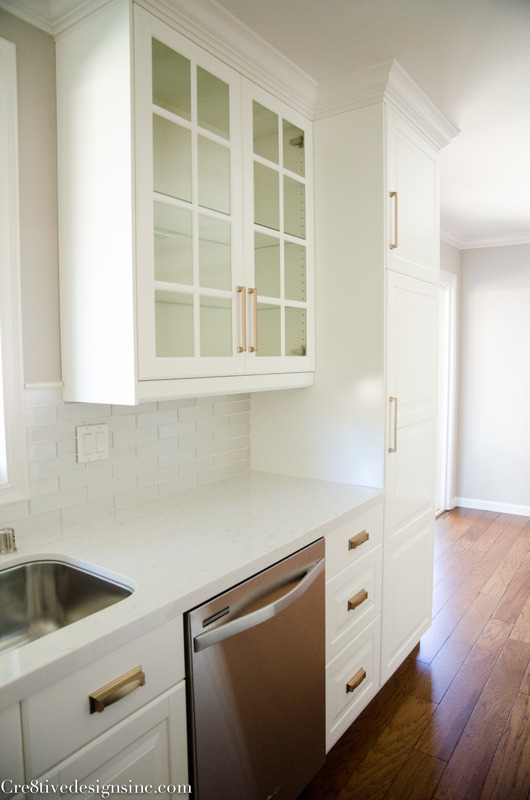 I’m also planning an IKEA kitchen using their BODBYN off-white cabinets, and was wondering if the IKEA cabinets you used were off-white or actual white in color? This is my only hesitation in choosing them, otherwise, I’d have ordered the kitchen already! Joyce, I am not familiar with their new line, but the old line was for sure more of a white than off-white. Hi, beautiful kitchen i fell in love with it! I am currently remodeling my kitchen and was wondering what size the upper cabinets are and the size of the handles you chose? I used the 6 1/2″ size. They have many to sizes to choose from, at different prices. What height upper cabinets did you use? I love the moulding. Your kitchen is beautiful! Could you tell me what the cabinet material is? Are they a thermofoil or laminate? I believe they are themofoil…but not certain…I’d check their website to be certain. Love love LOVE!! I have a small galley kitchen and am using Ikea to update. One of my biggest problems is lighting. I know you said you used LED lights…do you know how bright? And did you get the cooler (as opposed to warmer) color? Hoping you can tell me which exact bulbs you used! Thanks so much! Hello can you please share the source for the faucet? This is beautiful. Hello! 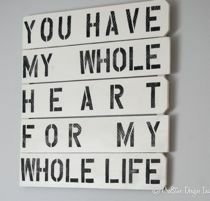 I am redoing my kitchen and fell in love with this a while back! Now I’m coming back to your page for inspo 🙂 I absolutely love the champagne bronze hardware. I found the pulls but what about the cup pulls?? Your help would be greatly appreciated! 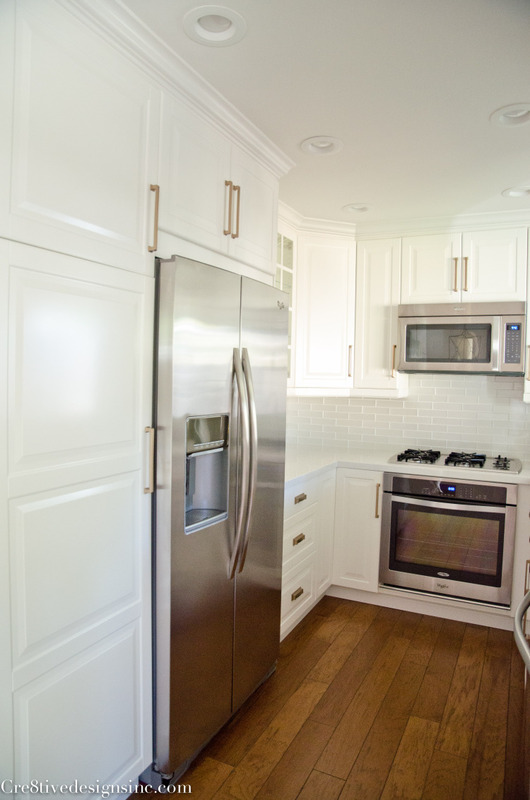 The cabinet hardware is all Atlas hardware in champagne bronze. 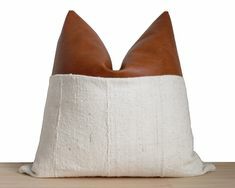 You can find many retailers online that sell them. I’m late to this conversation… but could you tell me the width of the kitchen? And/or the width of the space between the two rows of cabinets? It’s a lovely end result! Thx. 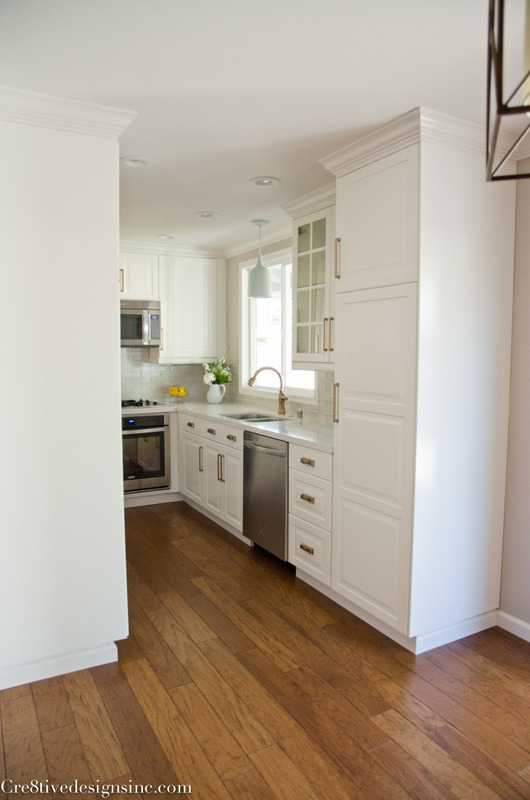 I can not remember the dimensions of the kitchen, but the walk space in between the cabinets was tight, like maybe 42″?